Now you can make sound business decisions in a matter of minutes that increase productivity, maximize operating benefits, improve product lifecycle management and reduce manufacturing costs. Find out how advanced analytics provides a desirable path to help manufacturers power up their capabilities, drive efficiency and better leverage machine and customer data. 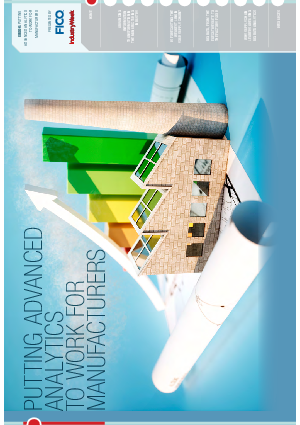 To Learn more, read this IndustryWeek eBook, sponsored by FICO, includes four articles about how a variety of manufacturers are using advanced analytics to "get ahead" in areas such as Big Data, supply chain and logistics, and other specific applications.